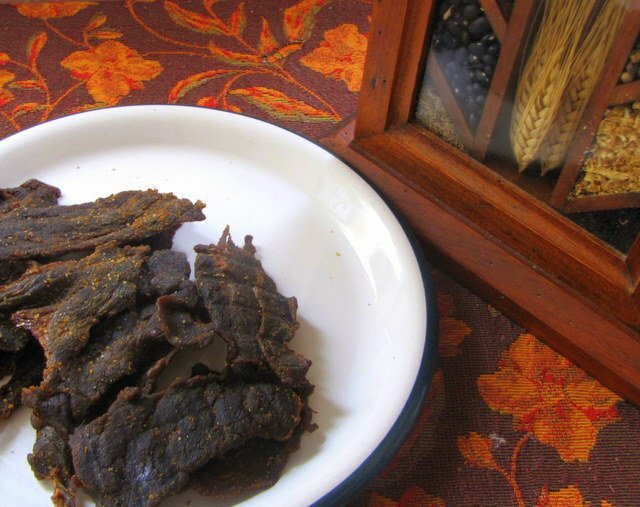 Foodin New England: Beef Jerky! What is it about beef jerky that everyone paying top dollar for a few pieces of leathery dried meat? Why pay that much when you can make your own right at home? it’s really very easy if you know what marinade you like, and have an extremely sharp knife. Sometimes your local butcher will even slice it up for you. You don’t need a smoker, just an oven and some patience. 1 cut of beef. i used a top round roast this time and it worked perfectly. Racks to place over the pans in the oven, you don’t want the meat touching the pan, it dries better if sitting up on the racks so the air can get all around it. Slice the meat, across the grain, into very thin pieces. Place into ziplock bags with marinade. I let mine sit overnight for best flavor and tenderness. I tried out Hannaford seasonings that i had on hand. One was Taste of Inspirations Cabo Chipolte rub. Not too spicy, but a good dose of flavor. I aaded the rub, a splash of olive oil, a few tablespoons of vinegar and a drop of Liquid Smoke. The other was a Taste of Inspirations “Steak Buger” seasoning, it’s sort of like Montreal Steak seasoning, very peppery and garlicy. I added a bit of oil, about 2 tablepoons of vinegar. last and certainly not least, Taste of Inspirations Sweet Apple Grilling Sauce. This stuff is unbelievable. It’s good on chicken, pork, beef.. anything. Just pour into ziplock bag with meat and a drop of Liquid Smoke. Next, lie the pieces on racks, not touching each other and place in a 200 degree oven. it takes a few hours and the aromas filling the house will be so enticing, but it is sooooo worth the wait. I store mine in the refrigerator, i don’t know how long it lasts because it doesn’t last more than a few hours in my house. See how easy it is? I guess i am off to make more!